Designed for street 396-502 c.i.d. big-block Chevy V8s using general duty oval-port cylinder heads. Will fit 1965-90 oval port heads. For 396, 402, 427 and 454 V8s with OEM 4-bbl. carb. ; 1965-72 (1973 non-CA) passenger cars and 1966-83 trucks, Suburbans and heavy vehicles; except stock equipped EGR. (Intake manifold p/n 350-3761 is for 454 V8s with OEM 4-bbl. carb. ; 1972-89. Will not fit under hood of Corvette without hood modifications. Will not fit ''tall block'' V8s. May be used with OEM or aftermarket carbs. Recommended intake gasket: Edelbrock 350-7203, Fel-Pro 375-1212, Mr.Gasket 720-107 Standard Seal, 720-5827 Ultra Seal, 720-820G Ultra Seal II. View Manifold ''A/B'' Measurement Guide. Choke adapter 350-8961 is included. Use water neck adapter 350-8028 with 1986 & later. use Automatic Divorced Choke Rod 350-9179 with Q-jet carb. Edelbrock Thunder Series AVS 800cfm Carburetor 350-1812 good for towing over 10,000 lbs. acceptable to factory cruise control. use carb square flange adapter plate 350-2732. Edelbrock Thunder Series AVS 800cfm Carburetor 350-1813 good for towing over 10,000 lbs. In order to use these camshafts in 1965-66 396/427ci blocks, it is necessary to machine a 3/16'' wide x 7/64'' deep groove in the rear main journal of the cam to allow oil flow to the top of the engine. Designed for optimum torque from the low-end to the mid-range. They are smooth idling cams for daily drivers, trucks, vans, RVs and 4x4s. You can expect a major improvement in throttle response and torque. Note: For computer controlled vehicles using Edelbrock intake manifold 350-3764. Not legal for sale or use on pollution controlled motor vehicles. Proven Performance With No Guesswork! The Edelbrock Performer Power Packages are designed for stock engines and significantly increase performance, fuel economy while lowering exhaust emissions. These packages provide incredible power from idle to 5500 RPM for your daily commute, towing, passing or uphill climbs in your car, truck, van or recreational vehicle. 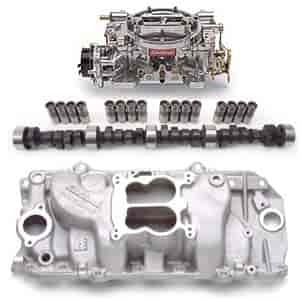 The main components of these packages include intake manifolds, carburetors and camshafts. Edelbrock also offers cylinder heads that match to optimize performance. For late-model fuel injected vehicles, Performer intake manifolds offer performance improvements with emissions equipment compatibility. Performer Multi-Point EFI Systems, camshafts and cylinder heads are also available to increase performance even further on GM vehicles originally equipped with throttle body injected V8's.